Positions. Localism. Regionalism. Nationalism. Mariano García-Colás. 5th August 1919. There are really three written concepts that weave and un-weave their respective affirmations. The skilled dialectics oppose the concept of localism to regionalism. They say, more or less, that they do not accept the regionalist ideal, because this is no more than an asphyxiating pretentious localism that would convert us into a clan, a tribe. 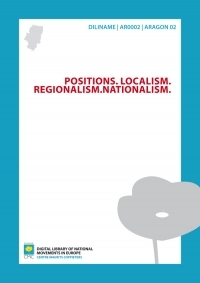 We –Aragonese nationalists, internationalists– say that it can in no way become localism, that which due to a circumstantial need, because of temperance, has come to be called regionalism. Regionalism or nationalism - a necessity of modern technical policies, modern technical administrations, a biological and social problem, the basis of the sublime universalism of tomorrow. We, in our own particular jurisdiction, believe that stating the problem in this way, with the word regionalism, even though it does not become localism, priori (this half word) makes us suspicious of that other more unacceptable one, localism. The word regionalism does no more than express the fear that its defenders have for clearly presenting the problem just as it is: a solely exclusive nationalist problem. It would be of little use to offer and use all our energy for such a small ideal of region, when there are other more magnificent terms such as socialism, christianism, naturalism, anarchism...! Regionalism –when not concealed nationalism– is inexplicable and inadequate. Even so, it can easily be mistaken for localism, synonymous with hermetecism. We, because of this, are nationalists. Categorically nationalists. El Ebro, 5th December 1919; reproduced by Antonio Peiró, Bizén Pinilla: El Ebro, 5th August1919; corrections on 20th August 1919; reproduced by Antonio Peiró, Bizén Pinilla: Nacionalismo y regionalismo en Aragón (1868-1942). Zaragoza, Unali, 1981, doc. 4, pp. 257-258. Comments: First article that talks about Aragonese nationalism.